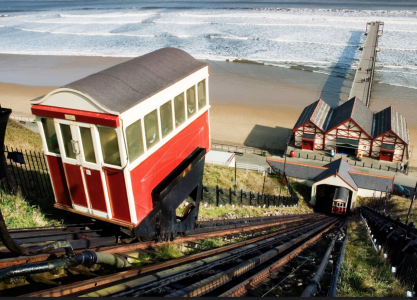 The delightful coastal town Saltburn-by-the-sea bestows plenty of Victorian charm and thrills. From the water balanced cliff lifts to the last remaining pier in Yorkshire, Saltburn promises its visitors an authentic seaside experience! 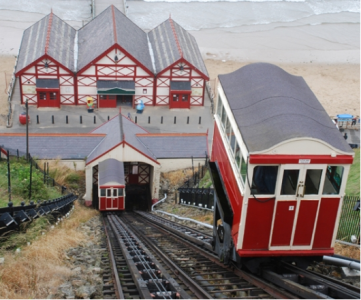 The Cliff Lift in Saltburn is probably the oldest of its type still in operation. Its two cars, each of which is fitted with a water tank beneath, run on parallel tracks. The car at the top of the 71% incline has its tank filled with water until it overbalances the weight of the car 120ft below and proceeds down the incline under its own specific gravity. The double steel wire ropes provide any additional control that is needed. When the car reaches the bottom its water is re-pumped to the top and the process begins all over again. The entire operation is controlled by the brake man from his little cabin at the top of the lift.